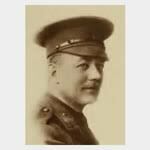 Captain Cecil Hill Darley (Royal Flying Corps) carries out two bombing attacks on St. Denis Westrem aerodrome, this being the longest double trip successfully performed up to date by any British airplane. Captain Lionel Pilleau Clay (Queen’s Own Yorkshire Dragoons) is killed by a bomb at age 37. He was Parliamentary Private Secretary to Lord Somerleyton and had been the Head of Harrow School in 1898 and is now acting as a Court Martial Officer. Flight Commander Guy William Price DSC (Royal Naval Air Service) is killed while strafing enemy positions near Givenchy-La Bassee at age 22. He is a 12-victory ace.